The Collared Aracari (Pteroglassus torquatus) is part of the toucan family. It breeds year round in the tropical rainforests of Central American and southern Mexico. It is a near-passerine bird which is brithly marked and its most distinctive physical characteristic is its amazingly large beak. 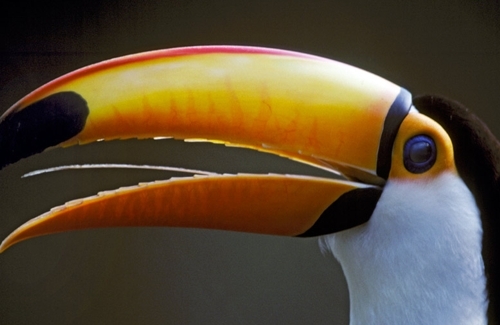 Their beaks are about 4 inches long, which is a quarter of the bird’s entire body. The collared aracari’s body is 41 cm long, and weighs about 230g. Both males and females are alike in appearance. On the rear neck of Collared Aracari is a reddish collar which is what is was named after in both English and its scientific name. Their bodies especially on their breasts and beaks are the colors of a rainbow. On their breasts, Collared Aracaris have feathers which are yellow, red and green in color. They also have red or blue feathers surrounding their eyes and a red-tinted black band across their belly. Their thighs are chestnut in color. Their bare facial skin is black and becoming pinkish behind their yellow eyes. The upper nozzle of the bill is dull yellow and marked with a black saw tooth pattern and black tip on the cutting edge. The lower beak is black while their legs are green. 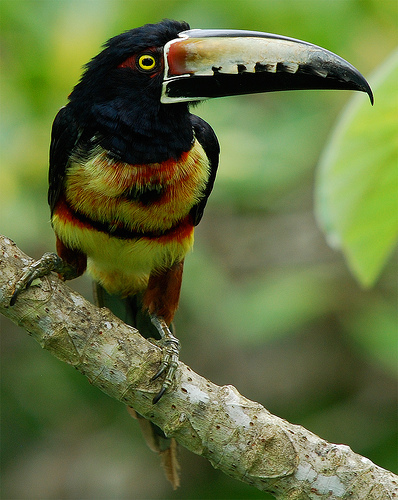 The Aracaris are related to the larger Toucans and are considered as Toucanets. The main difference between aracaris and toucans are their size and tail. The Collared Aracari has a sharper and pointed tail than the larger Toucans while their juvenile are much duller with a sooty-black head and brownish green on the upperparts. Their yellow underparts are paler with red rump and their breast has a spot. Their belly band and beak pattern are ambiguous. Aracaris move through the forest with a rapid direct flight in a small flocks usually consist of 6-15 birds. This species is mainly an arboreal fruit-eater but will also take insects, bird eggs, and other small animals. The Collared Aracari is a common breeder in the lowland forests and preferable in the open woodland. The eggs are laid in an old woodpecker nest or unlined natural cavity in a tree. Both sexes incubate their 3 white eggs for about 16 days and their toucan chicks will remain in the nest after hatching. They have short beaks and are blind and naked at birth. To protect their heels from the rough floor of the nest, they have specific pads on them. They are fed by their both parents and sometimes assisted by up to three other adults from a previous brood. They will leave the nest after about 6 weeks of continuing feeding by the adults. 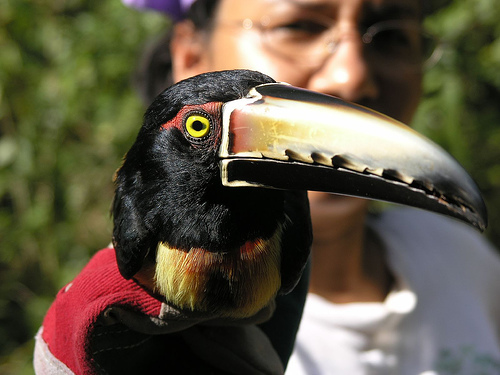 The Aracaris are highly sociable and cooperative toucans and commonly found in small flocks. The Collared Aracaris communally in tree holes. The young Aracaris are fed by a group of adults instead of just by their parents, up to six adults. This is unusual things for birds to do and these adults also fledged young sleeping with their tails folded over their backs in the same hole.